This blogpost first appeared as a Bite-Size Blog (BSB #167)) that was distributed to my mailing list on September 21, 2018. It is a well-known fact that sea levels are rising. But most people are unaware that those seas may be rising far more rapidly than mainstream scientists are predicting. But, rather than debate how soon or how much the rising seas may jeopardize our coastal cities, why not consider that whatever time we have before serious disaster strikes–as an opportunity to re-invent the way we live? Why not leverage the widespread certainty that sea levels are rising to galvanize support for designing a completely sustainable way to live in the United States? Why not create a model for the rest of the world to follow? I am talking about a green model that can enable us to truly live in harmony with nature; thereby improving our chances to survive and thrive indefinitely on planet Earth. A little background. We know that, sooner or later, rising seas will force the relocation of many millions of Americans. So, let’s leverage that widespread awareness to carefully plan, and start building, an ultra-green way for humankind to coexist with nature–indefinitely, on our beautiful planet. If the Earth improves as a result of our presence, then we will flourish. If it doesn’t, we will die off. This is our baseline. It can only get better from here. Clearly we have a lot of work to do. So let’s start the process in earnest NOW–long before millions of Americans are forced, with little or no advance warning, to abandon their coastal residences. So what is that creative IDEA? It begins with setting aside a ten-mile-wide corridor of land extending from Atlanta to Los Angeles. In the center of that corridor will be a hyper-loop train system than will enable rapid, highly efficient movement of people, food and other freight across the country. Ultimately, this system can eliminate the need for the vast majority of travel by automobile or airplane–both of which are environmental disasters. The southern location was selected because of a number of factors like moderate climate, more access to solar energy, proximity to food sources, no huge mountains to cross and the sheer abundance of sparsely developed open spaces. Within that corridor we can build a “Shangri-La” of sorts, featuring an ultra-green way of enjoyable living that will appeal to almost everyone. And it will be designed in such a manner that will minimize human interference with nature. Think of this new Shangri-La as an exquisitely planned human habitat covering 22,000 square miles and capable of providing an exceptionally rich lifestyle for up to 100 million residents. Worried about population density? The above numbers will equate to about 5,000 residents per square mile, which would be 80% less dense than New York City is today. Also, no one would be forced to move to America’s new “green” region. Instead, interested residents would undergo a thorough application process in which they formally agree to abide by an extensive set of community lifestyle regulations–all of which are aimed at protecting Mother Nature. 1. Vehicles. No one will “own” an automobile or bicycle. All would be shared and the autos would be powered by batteries that are charged 100% by renewable energy, primarily solar and wind. 2. Amenities. Parks, theaters, schools, natural spaces, biking paths, fountains and playgrounds would be abundant and beautiful. 3. 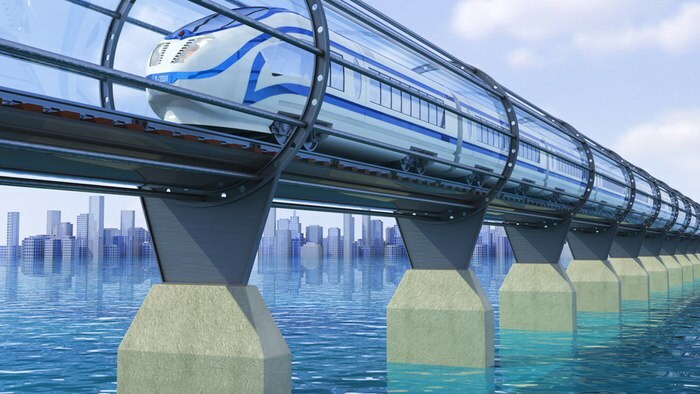 HyperLoop Trains. I envision three tubes in each direction: Local, Express and Freight . Most people could walk, bike or use shared vehicles to access this amazing system that could traverse the entire country in three hours. And most of it would be above ground, thereby affording breathtaking views at speeds up to 760 mph. 4. What about food? You guessed it, all food will be plant based. If anyone still doubts the grossly unsustainable insanity of eating animals, they should read this latest news about the overflowing “pig poop lagoons” in North Carolina. 5. Housing & Energy. All housing units would be designed to best leverage the highly efficient use of renewable energy to provide an exceptionally enjoyable lifestyle for all. And all human waste would be recycled. 6. Government & Economy? Above my pay grade and to be determined. But it would be nothing like what we currently have in the USA. Its overarching objective would be the protection of nature coupled with providing a life of comfort, meaning and dignity for all citizens. A true win-win for all concerned. What about government? I am calling it the American Green Region Authority (AGRA)–an organization that would be charged with managing this futuristic human habitat almost like a totally new country. 7. Future Vision . While the system is being rolled out and fine-tuned in that southern corridor, future regional systems could be planned. For example, we might want one to connect the Chicago area with the southern corridor in Texas and other viable routes to provide access to the NE and NW regions of the USA. And just think about the millions of jobs that will be created. Maybe we can prove him wrong about our dysfunction. Ultimately, I envision over 300 million Americans living in three or four corridors requiring a total of less than 100,000 square miles, an area about the size of Oregon. That would mean that over 90% of our nation’s citizens could live comfortably in less than 5% of our total area. After setting aside certain areas for food production, recreation, military and manufacturing–the rest could be returned completely to nature. No doubt you have many questions about this whole “idea.” I look forward to hearing those questions and to sharing further thoughts with you in person. Perhaps you can attend my next speaking event in NYC or maybe you can invite me to speak somewhere near you. PS: Try to consider the positives to be gained rather than dwelling on certain luxuries that might be lost. Also, we should think about the absolute horror show that will ensue if, or when, our civilization collapses. I truly believe that the process I have described herein is our generation’s chance to help make a satisfying life possible for all of the innocent children who follow us. One more thing, I encourage you to tell the good people at TED Talks that this is truly “an idea worth sharing.” It’s a lot better idea than trying to colonize Mars or the moon. Finally, do you have friends in or near New York City? If so, please tell them that on October 17, I will be delivering a “big picture” presentation (with emphasis on hope) at a venue near Penn Station, beginning at 6:30 pm and including a pot-luck dinner. Click here for details and to make a reservation. Introduction. This is the page where you can stay up to date relative to the sea ice extent in the Arctic. There are twelve charts below for the latest twelve months of data from the NSIDC, the National Snow and Ice Data Center. This page includes graphs showing sea ice extent by month since 1979. You will see below that records are being set for each month for the lowest ice extent on record. What about that Crisis in the Arctic? When we’re talking about something this serious, I always like to have hard data, like the “charts and graphs” mentioned above. To convey my preference for data over opinions, this image has been sitting on my desk for the better part of twenty years. The graph below tracks the sea ice volume in cubic kilometers. The gray bars below represent the volume of Arctic sea ice in thousands of cubic kilometers at the minimum level each year (occurs in September). For the past eight years, it has been about 75% less than the volume in 1979, when satellite imaging began. When the blue line touches the red line, there will be no ice in the Arctic Ocean. This chart is the minimum sea ice for 2018, occurring again in September. Earlier this year, I reached out via email to Dr. Peter Wadhams of the University of Cambridge to get his input on some alarming events that were taking place in the Arctic. He feared that this year would be the one where there was zero sea ice in the Arctic for at least part of September. Fortunately that did not happen, but probably will before 2023, five years from now. His response appears just below his image. Many thanks for your message. The Arctic ice has been behaving in a new way. In terms of annual mean extent, it is lower than ever before, but the decline in volume is spread throughout the year rather than being focused on September. The above graph shows this – the ice extent is paralleling the average at a lower level rather than diverging from it as summer approaches, but you can also see this if you go right back to last autumn. The ice is switching to a significant decline at all seasons, so an ice-free September, previously thought to be a dire warning, may not happen . Instead the ice just declines at all seasons until finally it goes altogether. So, based on his recommendation, I went to nsidc.org to research the “average monthly sea ice extent” in the Arctic Ocean since August of 2017. Each of the eleven graphs that appear below cover the period since 1979 when satellite imaging of ice cover began. Note that all of the following twelve graphs reveal that Arctic Sea Ice extent is following the same downward trend that Dr. Wadhams mentioned. I reviewed this Sam Carana chart with Dr. Wadhams in Feb. 2018, See one minute video below. While we’re on the topic of rapidly warming Arctic temperatures, take a look at the graph below that was recently created and posted at the Arctic News Blogspot by Sam Carana. The last datapoint is July 6, 2018. Note that this graph is just a snapshot look at one particular date (July 6) for each of the past five years. Given that it’s only one day over a five-year pereiod, I would like to think that the sharp temperature increase in this graph is a fluke. But given all the other data, like the above chart, I fear that these numbers may spell big trouble. Notice that the following nine “ice extent” graphs (from October to June 2018), all seem to be telling the same grim story regarding the disappearance of ice at the top of the world. Every single month of the year shows a sharp and continuing decline since 1979. The data is in millions of square kilometers. What’s next? The trend line is steadily downward for every month of the year since 1979. It’s only a matter of time before we have our first ice-free summer in the Arctic. Here are a few related BSBs on that topic. My guess is that most people would answer that “our own health” is more important. Not because they’re selfish or uncaring about the environment, but because they probably don’t know what’s at stake should our ecosystem no longer be able to sustain us. And they don’t know about the most powerful action we can take to promote ecological health. My answer to the title question is that NOTHING is more important than the sustainability of our ecosystem. That’s because without a healthy ecosystem, our civilization will collapse, making life a hell on Earth for those few of us who survive. And, when that happens, what good is being healthy if we don’t have enough food, water, shelter and clean air? 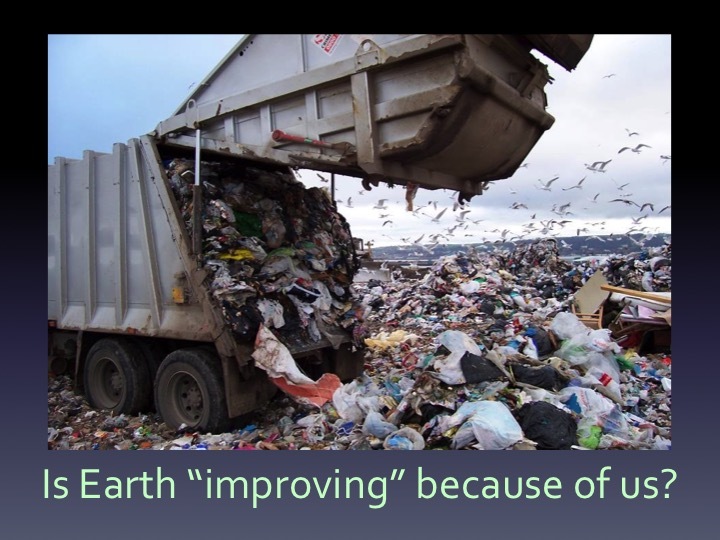 As for environmental health, most people think it’s a matter of recycling, taking shorter showers, driving electric cars, installing solar panels, etc. All good things to be sure, but only a drop in the bucket when it comes to preserving our ecosystem’s ability to sustain us. At the rate things are going, the Earth in the coming decades could cease to be a “safe operating space” for human beings. Overpopulation. Nearing 7.5 billion now, and rising by over 200,000 per day. Overconsumption. Our entire global economy is based on maximizing the consumption of STUFF in a world of finite resources. Dependence on Fossil Fuels. This is primarily driven by the first two, and despite all the windmills and solar panels out there, our consumption of fossil fuels increases each and every year. Eating the Wrong Food. Compared to a plant-based diet, the typical western diet (S.A.D. in the USA) requires over ten times as much land, water and energy to produce the same number of calories. We must eventually address ALL of the above issues in order to support the long-term sustainability of first, our civilization, and ultimately, the human species. The problem is that it will take many decades, if not centuries, to make all the necessary changes in the first three categories. But the GOOD NEWS is that the “wrong food” category can be fixed in a relatively short period of time. More good news — our consumption of animal-based foods is by far the leading contributor to most of our environmental problems. If we can fix that one, we can buy ourselves enough time to fix the other three. How do we fix the global feeding model? Filling our carts with plants NOW can buy us time to fix the other three categories of our grossly unsustainable lifestyle. 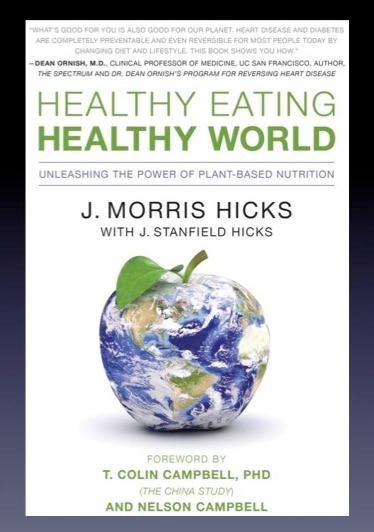 By convincing all humans that not only is a diet of whole, plant-based foods great for our health–it’s also the single best favor that we can do for our environment and for all humans who follow us on Planet Earth. Most people reading this article on this website already know about the power of whole, plant-based foods for promoting vibrant human health. Now, we just need to do our best to spread the good news about the most important benefit of eating plant-based foods: promoting the health of the fragile ecosystem that sustains us. More good news. The fact is that anyone who is eating animal-based foods can switch to mostly plant-based in just a matter of days. So, the single best thing that we can all do for our environment, our civilization and the future of our species is to help EVERYONE understand the most important reasons why they should make that switch–the sooner the better! In closing, consider this sobering factoid from the Global Footprint people. If everyone in the world lived like the average European, our planet could only support two billion people indefinitely. Even more sobering…if everyone tried to live like the average American, our precious planet could only support one billion people. We’re nearing 7.5 billion now and still adding over 200,000 people per day. This is why I call our food choices in the 21st century the most important topic in the history of humanity. That’s because our future as a species is riding on those choices. Finally, this article is not about doom and gloom; it is about simple third grade arithmetic that our global leaders have failed to embrace. Once they do, we’ll be well on our way to reversing climate change, restoring our rainforests and oceans and slashing the cost of healthcare throughout the world–truly a win-win for our own health and for the health of the ecosystem that supports us all. To be sure, he reluctantly gave me his blessing for that chapter in our book because, as a modest man of great substance and integrity, he is uncomfortable with such personal exposure and would never seek such recognition for personal benefit. To read that entire chapter now (about 5,000 words), click on the link below. Otherwise, continue reading. But Colin understands, as I do, that recognition from the Nobel Committee would put a stake in the ground about the relationship between food and cancer, to the benefit of billions of people around the globe–now and in generations to come. That recognition would also open the pathway to the eventual elimination of all animal-based foods that are so harmful to our health and our ecosystem–even threatening our future as a species. On 7-18-16, I sent out BSB #16 announcing how we had included a chapter in our new book on this topic. It is a mini version of this blog that appears in my “Bite-Size Blog” series. Click on this image to learn more about these mini blogs. The person who shall have made the most important discovery within the domain of physiology or medicine. Why is there such resistance from our top schools of nutrition and from the cancer industry in general? Why are they not thrilled that a possible cure for cancer is within reach? In a word, yet no one wants to say it out loud, it all boils down to MONEY. If the general public were to learn that cancer growth could be slowed, stopped or reversed–simply by choosing the right foods, the cancer industry would be in big trouble. This 2005 book made Dr. Campbell’s scientific findings about cancer available to the public. In 2016, I began asking the same question in all of my letters to VP Biden, in my speeches, in my blogs and in our new book. The Bottom Line. If Colin is correct in his conclusion that cancer growth in humans can be stopped by removing animal protein from the diet, and he is highly confident that it can, when the information finally hits the mainstream news, it will likely mean huge financial set-backs for not only the meat, dairy, and egg industries, but also for the huge global pharmaceutical industry, on pace to hit $1.3 trillion by 2019. Naturally, those huge industries are not real keen on a cure for cancer that might be as simple as choosing broccoli, beans and apples over burgers, omelets and cheese. But unlike our top schools of nutrition and medicine, the Nobel Committee is not beholden to those industries and may be able to start making things right by awarding their prestigious prize to Dr. T. Colin Campbell–before it’s too late. Colin will turn 85 in March of 2019 and the Nobel Prize is not presented posthumously. The oldest recipient ever was 87. To raise the global awareness of T. Colin Campbell and his world-changing research, please share this blog-post with everyone you know. It’s time to take control of our health away from the industries who’re more concerned about their profits than they are the health of their patients. Watch Dr. Campbell talk about his cancer research in this 2016 video, courtesy of Dr. John McDougall. For more on this topic, visit: What’s FOOD got to do with cancer? The Nobel Prize Nobel Prizes in Physics, Chemistry, Physiology or Medicine and Literature are awarded in Stockholm, Sweden, while the Nobel Peace Prize is awarded in Oslo, Norway. Join our Mailing List. If you’re reading this page now, you are probably “following” this blog. If you want to receive the new BSBs, you will need to be on our Constant Contact mailing list, which you can join by clicking here. June 6, 2016 — the date I posted the first BSB. When I typed that date, it reminded me of what happened on this same date–50 years ago. While driving my 1960 Chevy to work, I happened to glance down at the odometer and saw that it was reading 66,666.6 miles at that precise moment. Later that day, while in a store, the clerk asked me for the date to put on the receipt for my purchase. That’s when I said “June 6” and he proceeded to write 6-6-66 on the invoice while muttering, “Wow, that’s a lot of sixes.” That’s when I said “Oh, my God” as I remembered my odometer reading earlier that day. I felt at the time that I must’ve been in the “Twilight Zone,” a prominent TV show at the time. I was in college at the time and graduated almost exactly two years later, during the first week of June. My point here is that I will never forget June 6, 1966 and I hope that my readers will never forget June 6, 2016–the day that I launched this new generation of blogs that I predict will be much more effective than my original version of full-size blogs. As of today, almost 1,000 of them still reside on my website and have been read by millions of people in nearly 200 countries. The first one was posted on 2-10-11 and entitled: Barbara Walters…A Missed Opportunity. For your convenience, here is a link to the very first BSB, posted on 6-6-16. The Beta test period was highly successful and I will now be posting at least one or two of these new blogs per week. These “bite-size blogs” under the above image will take you no longer than one minute to read–and are designed to help you heal your body (if it needs healing) while healing your planet at the same time. A win-win for your health and for the future of humanity. Hopefully, you will find these new “bites” easy to digest on your mobile device. They are easily readable on my iPhone 6S shown here. Let me know if you have trouble. But you don’t have to find it today. “Stay Hungry, Stay Foolish” Steve Jobs Stanford University Commencement speech–2005. In June of 2005, Steve Jobs delivered his famous “You’ve got to find what you love” speech at Stanford University. A video and full text of that speech can be found under the Video tab of this website. In 2005, Steve was talking about the importance of finding your passion in life. And I am sure that, in the past 11 years, his speech has inspired millions to search for that passion. If you’re relying on a commencement speaker to set your compass, you may still be confused at day’s end. In my experience, it’s common to hear “Follow your passion” from the podium. This is great counsel if, in fact, you know what that passion is. But what if you don’t? In June of 1968, I graduated from Auburn University with a bachelor’s degree in Industrial Engineering, during the height of the Vietnam War. And I had no idea what my “passion” was at the time. But it didn’t really matter, because my immediate future was already decided–by the United States government. All I had to decide was in which branch of the military I wanted to serve. Forty-eight years ago today, I was somewhat happy that I didn’t have to make any huge career decisions. I had already applied to officer programs in the Navy, Air Force and Coast Guard and was almost certain that I would be serving in one of them by year’s end. And I was right–about seven months later, I was a newly-commissioned ensign in the U.S. Coast Guard, on my way to serve my three-year tour in Honolulu. Move toward what interests you. My three years with the Coast Guard in Honolulu played a huge part in my later career & life. Because I was comfortable with math and solving problems, I took advanced math courses in high school and chose to major in engineering in college. Because I liked “big picture” stuff more than details, I changed my college major from mechanical to industrial engineering at the end of my sophomore year. Wanting to broaden my perspective beyond engineering, while based in Honolulu, I earned an MBA at the University of Hawaii. Knowing that I liked solving problems more than I did sales, I left my first job as a sales engineer with Alcoa to become a consulting engineer with a consumer goods management consulting firm in 1972. Knowing that I wanted more continuity instead of an endless series of projects in my work, I left the consulting firm after nine years to become one of the division presidents of a Fortune 1,000 corporation in 1981. Knowing that I was not in love with the fashion industry where I was working, I ended up as an executive search consultant with my own firm in 1999–a career that has provided me with the freedom to explore other interests–for the past 17 years. Finally, after becoming curious about the optimal diet for humans in 2002, within six months, I realized that I had found my passion in life and that it drew heavily upon my personality, education, personal interests, sense of purpose and career. Happy Graduation to all who will be walking to the tune of Pomp and Circumstance as you receive your diplomas this month. Hopefully, some of the information covered here will help you in your quest for finding your passion. For if you’re doing what you love, you’ll never have to work a day in your life. One final bit of advice. Adopt a simple life, live within your means and beware of getting trapped by a high salary in a career you don’t enjoy. Keeping things simple now will raise your chances of finding what you love in the future. I didn’t find it until I was 58 years old–and I wouldn’t want to have it any other way.